completely independent parts. The same computation is undertaken on each part. And some kind of post processing after the computations is needed. service broker, and service broker forward these requests to service instances. components are all service oriented(more specifically, WCF based). in a real Windows Hpc Cluster. different from client/dev machines and network env. 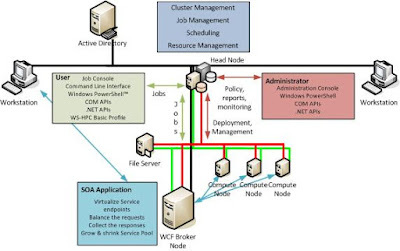 to connect with both cluster private network and corp/enterprise network. is different from Hpc Cluster private network domain account. calculation contains two parts - the server part and client part. out a random seed number. This will make the whole process more random. 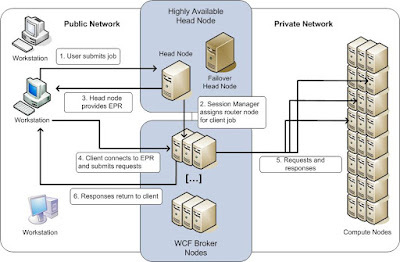 which will call remote WCF service and Hpc scheduler service. sub-tasks and compute the final result. security mode must be Transport and you cannot enable reliable sessions. see the source code package. as the machine name of the head node of the Hpc cluster. also helpful for investigation when error encountered. development process of some specific kind of Hpc applications. problem really matter in a private computing cluster? solved in a very elegant and scalable way.